Currently, the provision of housing for civil servants of the Russian Federation is an integral part of the social protection of state servants of the Russian Federation, as well as one of the acute social problems in Russia due to the fact that housing is a priority need for human, which a civil servant of the Russian Federation cannot always implement due to a low salary. 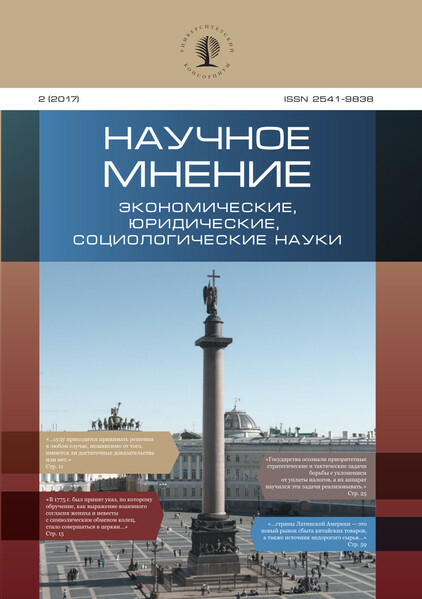 The article discusses and analyses the mechanisms of housing provision for civil servants in the state civil, military and law enforcement service of the Russian Federation in order to present a holistic view of the effectiveness of these mechanisms or the need for their improvement. Federation, military servicemen of the Russian Federation, law enforcement servicemen of the Russian Federation, social guarantee, housing, lump sum subsidy, housing certifi - cates, savings and mortgage system, service housing. 1. Izmest’yev A. V. Pravovoe regulirovanie sotsial’noy zashchity naseleniya Rossiyskoy Federatsii v zhilishchno-kommunal’noy sfere: dis. … kand. yurid. nauk. Omsk, 2005. 172 s.
2. Matveyev S. P. Sotsial’naya zashchita gosudarstvennykh sluzhashchikh: teoreticheskie osnovy postroeniya sistemy, praktika osushchestvleniya i problemy pravovogo regulirovaniya: monografi ya. Voronezh: Voronezhskiy institut MVD Rossii, 2011. 214 s.
3. Ob utverzhdenii Pravil rascheta subsidii dlya priobreteniya ili stroitel’stva zhilogo pomeshcheniya (zhilykh pomeshcheniy), predostavlyaemoy voennosluzhashchim — grazhdanam Rossiyskoy Federatsii i inym litsam v sootvetstvii s Federal’nym zakonom «O statuse voennosluzhashchikh: Postanovlenie Pravitel’stva Rossiyskoy Federatsii ot 3 fevralya 2014 g. № 76 (v red. ot 29 dekabrya 2016 g.): SZ RF. 2014 g. № 6. St. 590 // Rossiyskaya gazeta. 2014. № 31. 4. O gosudarstvennoy grazhdanskoy sluzhbe Rossiyskoy Federatsii (prinyat GD FS RF 7 iyulya 2004 g.): Federal’nyi zakon ot 27 iyulya 2004 g. № 79-FZ v red. ot 3 iyulya 2016 g. SZ RF. 2004 g. № 31. St. 3215 // Rossiyskaya gazeta. 2008. № 162. 5. O poryadke priznaniya nuzhdayushchimisya v zhilykh pomeshcheniyakh voennosluzhashchikh — grazhdan Rossiyskoy Federatsii, obespechivaemykh na ves’ srok voennoy sluzhby sluzhebnymi zhilymi pomeshcheniyami, i predostavleniya im zhilykh pomeshcheniy v sobstvennost’ besplatno: Postanovlenie Pravitel’stva Rossiyskoy Federatsii ot 29 iyunya 2011 g. № 512 (v red. ot 29 dekabrya 2016 g.): SZ RF. 2011 g. № 28. St. 4210 // Rossiyskaya gazeta. 2011. № 147. 6. O predostavlenii voennosluzhashchim Vooruzhennykh Sil Rossiyskoy Federatsii zhilykh pomeshcheniy po dogovoru sotsial’nogo nayma i sluzhebnykh zhilykh pomeshcheniy: Prikaz Ministra oborony Rossiyskoy Federatsii ot 30 sentyabrya 2010 g. № 1280 // Rossiyskaya gazeta. 2010. № 5325 (246). 29 oktyabrya. 7. O predostavlenii federal’nym gosudarstvennym grazhdanskim sluzhashchim yedinovremennoy subsidii na priobretenie zhilogo pomeshcheniya: Postanovlenie Pravitel’stva Rossiyskoy Federatsii ot 27 yanvarya 2009 g. № 63 (v red. ot 24 noyabrya 2016 g.): SZ RF. 2009 g. № 6. St. 739 // Rossiyskaya gazeta. 2009. № 17. 8. O sotsial’nykh garantiyakh sotrudnikam nekotorykh federal’nykh organov ispolnitel’noy vlasti i vnesenii izmeneniy v otdel’nye zakonodatel’nye akty Rossiyskoy Federatsii: Federal’nyi zakon ot 30 dekabrya 2012 g. № 283-FZ (v red. ot 5 dekabrya 2016 g.): SZ RF. 2012 g. № 53 (ch. 1). St. 7608 // Rossiyskaya gazeta. 2013. № 3. 9. O sotsial’nykh garantiyakh sotrudnikam organov vnutrennikh del Rossiyskoy Federatsii i vnesenii izmeneniy v otdel’nye zakonodatel’nye akty Rossiyskoy Federatsii: Federal’nyi zakon ot 19 iyulya 2011 g. № 247-FZ (v red. ot 29 iyulya 2017 g.): SZ RF. 2011 g. № 30 (ch. 1). St. 4595 // Rossiyskaya gazeta. № 157.